Providing you the best range of husk fired thermic fluid heater, husk fired thermal fluid furnace heaters, thermic fluid heater and wood fired thermic fluid heater with effective & timely delivery. Help homogeneous mixing of fuel, maintain uniform bed temperature, leaves low unburnt fuel along with the dust collector, I.D. and F.D. fan for balance draft to ensure minimum infiltration of unwanted air through doors fresh air passes through air pre-heater ensure maximum fuel to heat operating efficiency for any commercial grade of solid fuel. The capacity ranges from 2 Lacs to 30 Lacs kcal/hr. The vertical four pass thermic fluid heater is suited for indian industries in rapidly changing and undependable energy situation. The vertical design coupled with integral furnace gives you an assurance of rated output on any solid fuel like Coal, Wood, Husk etc. Reduced Excess Air - Radiant heat exchanger above furnace, cools down floe hence, less excess air needed. This gives rise to efficiency. Air Pre - heating - Combustion air from FD fan passes through air preheater to absorb the waste heat from the fuel gases. This result in further increase in efficiency. Balanced Draught System - This system ensures minimum infiltration of unwanted air through fire doors. Hence, all the combustion air passes through the APH. Thus the maximum heat recovery from APH takes place, which assures rated efficiency. Rated Output - Thermotech's vertical heater model gives you rated efficiency its catagorized output. 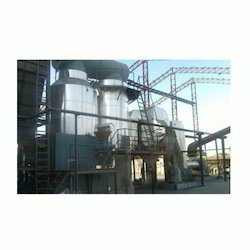 Multifuel Option - The system is suitable for coal, wood, husk etc. for full output with minor modifications in combustion chamber. We offer Husk Fired Thermal Fluid Heaters to our clients. 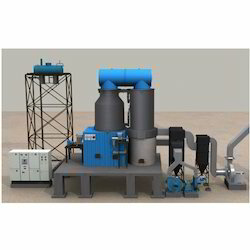 In addition to the previous model TSCV the system is designed with FBC Technology to ensure complete combustion, help homogeneous mixing of fuel, maintain uniform bed temperature, leaves low unburnt fuel along with the dust collector, I.D. and F.D. fan for balance draft to ensure minimum infiltration of unwanted air through doors fresh air passes through air pre-heater ensure maximum fuel to heat operating efficiency for any commercial grade of solid fuel. The vertical four pass thermic fluid heater is suited for indian industries in rapidly changing and undependable energy situation. The vertical design coupled with integral furance gives you an assurance of rated output on any solid fuel like Coal, Wood, Husk, Bagasee etc. Air Pre - heating - Combustion air from FD fan passes through air pre heater to absorb the waste heat from the fuel gases. This result in further increase in efficiency. Thermic Fluid Heater based upon advanced technology is offered by us. Our products are precisely engineered under the stern supervision of experts. We ensure that the products we offer not only comply with the specific norms but also meet the customer’s expectations. One can avail our range in various specifications. Our Wood Fired Thermic Fluid Heater is suited for Indian industries in rapidly changing and undependable energy situations. The vertical design coupled with integral furnace gives you an assurance of a rated output on any solid fuel like coal, wood, husk etc. Thermotech's generous design helps in changeover from one fuel to another without compromising on performance. This quality assure product comes from Thermotech, the company known for its expertise of boilers and heaters all over India. Today there are over 1000 Thermotech installations in the country practically in all types of industry reducing time and cost. Air Preheating - Combustion air from FD fan passes through air preheater to absorb the waste heat from the fuel gases. This result in further increase in efficiency. Rated Output - Thermotech's vertical heater model gives you rated efficiency its catagoriesed output. 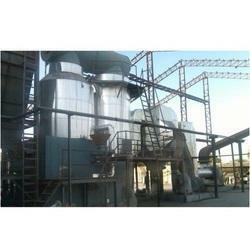 Multifuel Option - The system is suitable for coal, wood, bagasse etc. for full output with minor modifications in combustion chamber.